The Rainbow Family Centres are proudly family owned and operated. We have been operating our Rainbow centres in the Macarthur area for over 17 wonderful years. There’s Mum (Diane), Dad (Ron) and their now grown up daughters (Justine and Rachel). Justine and Rachel are both University Trained teachers with a combined total of 47 years experience in the Education field. Like you and your family we juggle careers, children, parenthood, relationships, family life and domestic responsibilities. Also like you, especially when it comes to our own children, we look for empathy, flexibility, understanding and personalised care. That’s why it’s so important to us to provide these qualities for your family at Rainbow. We believe the community of care and education we provide, will become invaluable to you, to your child and indeed to your whole family. That fabric of mutual support is a unique experience that you will not find in many other centres. Of all our achievements over the years, we are most proud of the fact, that we have created a service that feels like home. Just like visiting Nan and Pop or Aunty and Uncle. We believe this is exactly what families want for their precious little ones and exactly what children need to flourish. The relationships we have built with all the families and children over the years are hugely rewarding and provide us with the motivation to continue the Rainbow Family Story long into the future. Almost everything at Rainbow has a story behind it, a little piece of heart and soul. Our logo is no different. 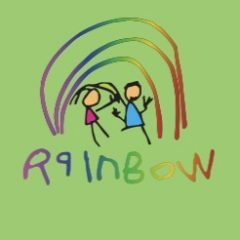 In fact, the very first group of children we had at Rainbow worked together to design what would become the logo you see today. It was then hand drawn by an amazing little artist (who is now all grown up) and has been our logo ever since. It has been on many uniforms, letter heads, signs, flyers, hats and t shirts, but it has remained original and unchanged ever since the day it was drawn. This is a reminder to everyone where Rainbow has come from and an acknowledgement that each child who becomes part of our “family” will have a place our hearts forever. The Rainbow name is also steeped in tradition. When we very first took over our first centre the name was already ‘Rainbow Long Day Care Centre’. As we grew over the years and more centres joined our family, we made a slight adjustment to our name and ‘The Rainbow Family Centres For Children” was born. Our new name pays tribute to our start in the Early Childhood field as well as incorporating our all important family focus. We are extremely proud of our Centres “Family Crest” Our Crest was designed by one of our most long standing Educators. Our Crest signifies all of the important things that Rainbow stands for and symbolises the unity and respect that we share as a service.